Afterlight Tribute is a monochromatic blog theme with an option for a full-screen background image. It is a simple blank canvas theme. 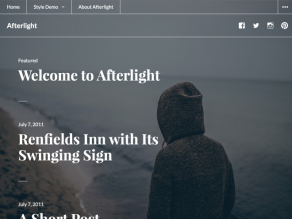 this theme is based on the popular, open-source Wordpress theme Afterlight. a blog or organization that wishes to be seen as stylish is a good example of how to use this theme. a traditional/blue-chip type business is probably not a good fit for this theme. This theme has been manually tested successfully creating and viewing nodes and style guide in Backdrop 1.4 and Backdrop 1.3 with the Mobile Navigation, Webform and Responsive Menus modules. This theme is not affiliated with Yahoo! or the PureCSS developers or Automattic in any way. After clearing your site cache, visit /admin/appearance/list . Enable Afterlight Tribute Subtheme, and make it your default theme. Now, you can edit custom styles in this theme while it inherits styles from its parent theme afterlight_tribute. When updates come out for the afterlight_tribute theme, you can just copy and paste or update the parent theme any time and it won't erase your custom theming work (which is done now in the child theme afterlight_tribute_subtheme). You work in the top-level afterlight_tribute_subtheme theme. If you like, you can rename every instance of afterlight_tribute_subtheme to your own theme name, and by copying and pasting your subtheme folder, you can create more than one subtheme.